William Tuke (24 March 1732 – 6 December 1822) was an English businessman, philanthropist and Quaker, instrumental in developing more humane methods in the custody and care of people with mental disorders using "gentler" methods, an approach that came to be known as moral treatment. He was a major figure in founding The Retreat at Lamel Hill in York as a place for treating mental health needs. Tuke and his wife Esther Maud supported stricter adherence to Quaker principles. He was an abolitionist, a patron of the Bible Society, and a vocal opponent of the East India Company's inhumane practices. William Tuke was born on 24 March 1732 in York into a prominent Quaker family. His father, Samuel, was a stuff-weaver and shopkeeper who died when Tuke was 16. His mother, Ann, died seven years later. Tuke attended boarding school for two to three years after which he pursued further studies under clergymen. At age 14, he began an apprenticeship at his aunt's wholesale tea business, which he inherited upon her death in 1752. Tuke married Elizabeth Hoyland in 1754 and fathered four children. After Elizabeth died giving birth to their fifth child, Tuke met and married Esther Maud in 1765. Tuke and his wife were deeply involved in the Friends community and advocated for stricter adherence to Quaker principles. For five decades, he travelled to London for Yearly Meeting and served as clerk at the 1783 meeting. During this time, Tuke remained involved in the family business alongside his eldest son and business partner, Henry. In 1791, William Tuke was moved by an incident involving Hannah Mills, a melancholic Quaker widow who died unexpectedly at York Lunatic Asylum. Although the cause of her death was not determined, mistreatment was suspected, and the managers had forbidden Mills from having any visitors. Tuke's daughter, Ann, proposed the idea of a mental institution run by Quakers for their own members. At a Society of Friends meeting in March 1792, Tuke presented his plan for those who "laboured under that most afflictive dispensation – the loss of reason." However, the proposal was met with significant opposition. Some members felt that the creation of such an institution was unnecessary, while others saw it as overstepping the jurisdiction of the Quaker community. A small minority of supporters included Tuke's son, Henry, and grammarian Lindley Murray. During a visit to St. Luke's Hospital in London, Tuke witnessed the appalling conditions in which patients were kept. He was particularly affected by a naked, female patient who had been chained to a wall. Tuke believed that the abuse was not the result of cruel intent but rather a lack of effective alternatives. By 1795, financial and social support from the community was still limited. The Society of Friends eventually approved the plan when Tuke's friend, Lindley Murray, suggested raising funds through annuities. Tuke bought an 11-acre parcel for £938 and worked closely with London architect John Bevans to carry out his vision for the new asylum. Unlike other institutions of the time, York Retreat featured long, airy corridors that allowed patients to take a stroll even if they were restricted from going outside. A month after the first patients arrived in June 1796, the unexpected death of superintendent Timothy Maud forced Tuke to step in and run the Retreat himself. William Tuke allowed his doctors to make their own observations and apply them to their practice. Bleeding and other traditional remedies were abandoned in favour of gentler methods, such as warm baths for patients with melancholia. Tuke believed that physical and mental health were inextricably linked and emphasized the importance of a proper diet and exercise. He sought to instill a sense of reason, not fear, and limited the use of physical restraints. Patients were encouraged to make themselves comfortable and often took up jobs like sewing and knitting. The approach was widely derided at first, and William Tuke noted that "All men seem to desert me." However, it became famous around the world as a model of more humane and psychologically-based approaches. Outside his work at the Retreat, Tuke helped in founding three Quaker schools: Ackworth School, Bootham School, and Trinity Lane Quaker Girls’ School. The latter was run by Tuke's second wife Esther until her death in 1794. The Tuke family continued to run the school until 1812, by which point 500 students had passed through it. As a patron of the Bible Society, Tuke attended its meetings and contributed generous donations. Tuke campaigned against the slave trade and supported abolitionist William Wilberforce in the 1806 Yorkshire parliamentary election. Tuke was one of few voices in Britain opposing the East India Company for its inhumane impact on other countries. He was also a subscriber to the African Institution, the body which set out to create a viable, civilized refuge for freed slaves in Sierra Leone, Africa. Towards the end of his career, a resurgence of patient abuse at the York Asylum prompted Tuke to take to the local press and demand urgent reform. Tuke provided evidence to the Select Committee on Madhouses in May 1815, which led to further inquiries and the passage of the County Asylums Act in 1828. Tuke remained involved with the Retreat until he became blind at age 82. He died on 6 December 1822 after a paralytic attack. Several of Tuke's family members pursued similar philanthropic work. His son Henry (1755–1815) co-founded the York Retreat. At Henry's request, his son Samuel wrote an 1813 account on the Retreat and popularized the principles of "moral treatment". Samuel's son James Hack Tuke also helped to manage the York Retreat, while his brother Daniel Hack Tuke co-wrote A Manual of Psychological Medicine (1858) and became a leading physician and expert in insanity. His daughter Sarah Tuke Grubb founded a school in Ireland. ^ a b c d e f Glover, Mary R.; Glover, Janet R., eds. (1984-05-01). The Retreat, York: Early Quaker Experiment in the Treatment of Mental Illness. York, England: William Sessions Limited. ISBN 9780900657887. ^ Thomas Bewley. "Madness to Mental Illness. A History of the Royal College of Psychiatrists. Online archive 1, William Tuke (1732–1822)" (PDF). ^ a b c d e Kibria, A. A.; Metcalfe, N. H. (2016). "A biography of William Tuke (1732–1822): Founder of the modern mental asylum". Journal of Medical Biography. 24 (3): 384–388. doi:10.1177/0967772014533059. PMID 24944052. ^ a b Samuel, Bill. 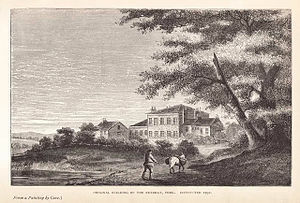 "Quaker Tour of England - The Retreat Mental Hospital - QuakerInfo.com". www.quakerinfo.com. Retrieved 2017-02-28. ^ a b Digby, Anne (2004). "Oxford DNB article: Tuke, William". www.oxforddnb.com. 1. doi:10.1093/ref:odnb/27810. Retrieved 2017-02-28. ^ EDITOR, FORBES WINSLOW (1855-01-01). THE JOURNAL OF PSYCHOLOGICAL MEDICINE AND MENTAL PATHOLOGY. VOL. VIII. ^ "Loot: in search of the East India Company". openDemocracy. Retrieved 2017-02-28. ^ Sixth Report of the Committee of the African Institution. London: African Institution. 1812. ^ "BBC – History – Historic Figures: William Tuke (1732–1822)". Retrieved 2017-02-28. ^ Mitchell, Jonathan Paul. "Religious Melancholia and the York Retreat 1730–1830" (PDF). The University of Leeds. Claus Bernet (2009). "William Tuke". In Bautz, Traugott. Biographisch-Bibliographisches Kirchenlexikon (BBKL) (in German). 30. Nordhausen: Bautz. col. 1527–1530. ISBN 978-3-88309-478-6. York Quaker memorial statement of 1823 concerning William Tuke from Google Book search. This article incorporates text from a publication now in the public domain: Chisholm, Hugh, ed. (1911). "Tuke" . Encyclopædia Britannica. 27 (11th ed.). Cambridge University Press. p. 365. This page was last edited on 10 February 2019, at 21:27 (UTC).